The Agile Business Advanced – Facilitating the Process certificate is meant for people who work with Agile Scrum in a non-IT context. The certificate establishes your knowledge of Scrum and your ability to apply it. It focusses on the Scrum Master role within Scrum and obtaining this certificate demonstrates your expertise as Scrum Master in a non-IT context. In other words: you know how to facilitate the scrum process in such a way that teams deliver optimal performances. With this certificate you will be of interest to employers who want to introduce or apply Scrum in predominantly non-IT teams. 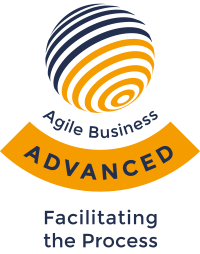 The Agile Business Advanced – Facilitating the Process certificate is meant for professionals who have in depth knowledge of the Scrum Master role within a non-IT environment. Considerable theoretical comprehension is required for this certificate; please make sure you studied the curriculum extensively. Practical knowledge is not mandatory but gives a clear advantage. It is not mandatory to take a course with any of the official partners of the IIABC; if you have in depth knowledge of the material and are comfortable with taking the exam you can do this online directly or at any given moment. However, completing a relevant course does significantly increase your chances of passing the exam. Our official partner in the Netherlands is Agile Scrum Group. You can take this Scrum Master course to prepare you for the exam. Do you have questions about this certification? Contact us via info@iiabc.org.